This article is about the 1998 novel. For the 1949 film, see I Married a Communist (film). 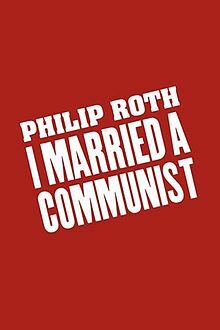 I Married a Communist is a Philip Roth novel concerning the rise and fall of Ira Ringold, known as "Iron Rinn." The story is narrated by Nathan Zuckerman, and is one of a trio of Zuckerman novels Roth wrote in the 1990s depicting the postwar history of Newark, New Jersey and its residents. Ira and his brother Murray serve as two immense influences on the school-age Zuckerman, and the story is told as a contemporary reminiscence between Murray and Nathan on Ira's life. Although a communist, Ira became a star in radio theater. Personal conflicts with McCarthyite politicians, a gossip columnist, and his daughter-addled and manipulative wife all combine to destroy Ira and many of those around him. Some reviewers, especially those in the British press such as Rachelle Thackray of The Independent and Linda Grant of The Guardian, consider the character of Eve Frame — the antisemitic wife who destroys Ira — to be a barely disguised riposte to Roth's ex-wife, Claire Bloom, for her unflattering memoirs, which portrayed Roth as unable to bottle his vanity and incapable of living in the same household with Bloom's daughter, Anna Steiger. However, Frame is portrayed fairly sympathetically in the novel. She destroys Ira's career (unintentionally) after being manipulated by his enemy, Brydon Grant. She later attempts to make amends for having done this. Frame is a Jewish actress, so is Bloom. Frame's second husband is a financier, so was Bloom's. Eve Frame has a daughter who is a harpist, Bloom's girl is an opera singer. Ira tells the daughter to move out, Roth did the same. Ira has an affair with the daughter's best friend; Roth, Bloom alleged, came on to her own daughter's best friend. She argues I Married a Communist "is not a novel", but rather, "an angry, bitter, resentful mess by a man who might have taken another course." ^ Thackray, Rachelle (October 11, 1998). "Roth takes novel revenge on ex-wife Claire Bloom". The Independent. ^ a b Grant, Linda (October 3, 1998). "The wrath of Roth". The Guardian. This page was last edited on 11 December 2016, at 20:29 (UTC).